I have some misgivings over my future plans in life. I should have finished my doctorate degree last semester. I still have to submit my dissertation before I could graduate. But, I fret no more. For the New Year, I made a resolve to finish the dissertation and graduate this year. I am excited already to graduate and finally achieve a greater sense of fulfillment in this life's dimension. I only wish, though, that the Graduate School student officers' will be able to think of a school project that would give a meaningful memento to the students during their graduation day. 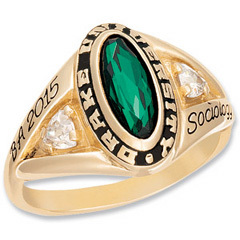 It would be great to have a college class ring designed with a gemstone and logo of the school embedded on it. I especially love the designs of the joyjewelers.com college rings. They are just great! I sure will bring this to the attention of the school officers once I enrol in the next semester. Here, I attached a sample image so you will get to see a glimpse of what I am saying.